Japan, no doubt, is home to several splendid innovations. Right from its tech-savvy products to its food, the land of the rising sun never fails to amuse the world with its unusual offerings. 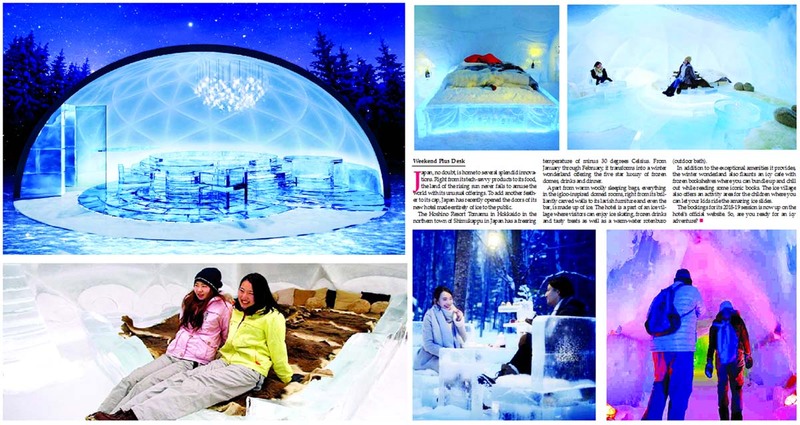 To add another feather to its cap, Japan has recently opened the doors of its new hotel made entirely of ice to the public. The Hoshino Resort Tomamu in Hokkaido in the northern town of Shimukappu in Japan has a freezing temperature of minus 30 degrees Celsius. From January through February, it transforms into a winter wonderland offering the five star luxury of frozen domes, drinks and dinner. Apart from warm woolly sleeping bags, everything in the igloo-inspired domed rooms, right from its brilliantly carved walls to its lavish furniture and even the bar, is made up of ice. The hotel is a part of an ice village where visitors can enjoy ice skating, frozen drinks and tasty treats as well as a warm-water rotenburo (outdoor bath). In addition to the exceptional amenities it provides, the winter wonderland also flaunts an icy cafe with frozen bookshelves where you can bundle up and chill out while reading some iconic books. The ice village also offers an activity area for the children where you can let your kids ride the amazing ice slides.